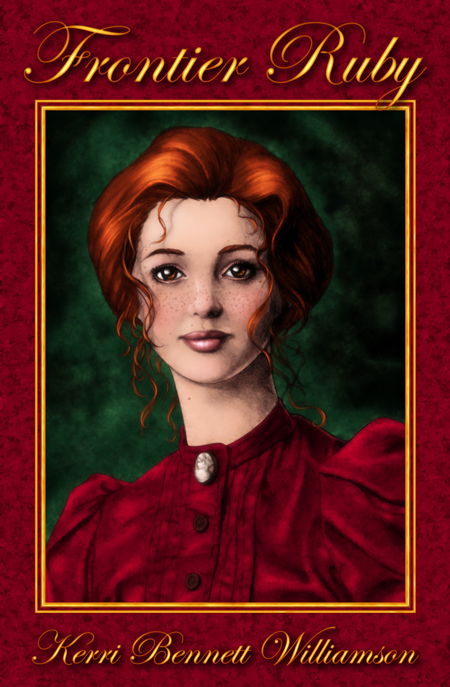 Frontier Ruby was inspired a little by my love for ‘Anne of Green Gables’ as well as a little ‘Jane Eyre’, with some ‘goes west to the frontier’ thrown in. This story is more of the dramatic but many have told me that they found some comedic moments too. I know I had fun writing it. Not actually an ardent doll collector at the time, I once chanced upon an almost life-size porcelain doll that I instantly fell in love with, but never bought because it was so large and its very limited artist’s edition creation also priced it out of my comfort zone for buying, though I did keep a portrait of that adorable little girl doll. When I sketched in the idea for this novel, I asked my daughter Brina to use that little doll-face as inspiration for her initial sketch. Bright red hair, big brown eyes, a tiny nose, some scattered freckles and a decade or two of growing up was what I asked for. Once Brina had shown me her ‘close’ idea, it became a little like a ‘police sketch’ event to get Ruby’s face to exactly where I imagined. Voila, with the help of my daughter, Ruby was born to perfection. This Ruby is favorite of many I know, as they’ve told me, and they have also told me that what’s in this book suits it’s cover girl. Another thing I’m often told about Frontier Ruby is that her story begs to be made into a musical play. That work has begun to be in the works (but not by me!). I can’t wait to see what this Ruby grows up into, in play form, musical or otherwise. One thing I can tell for now, though, is that in the book Ruby gets her man and her deserved happy ending.